On An Overgrown Path: Rhythm Is It! - the new Fantasia? Rhythm Is It! - the new Fantasia? A recent New York Times article said it all - "As audiences seem to grow older and the public turns its attention away from concertgoing, orchestras around the country are adopting a wide array of methods, from the trivial to the thoughtful, to bring more people into the concert hall. They are hunting for the neophytes, the dabblers and mainly the ungray." A great feature film with classical music at its core is a sure-fire way to attract a new generation of concertgoers . Walt Disney and Leopold Stokowski did it with Fantasia. The project started in 1937 when Walt wanted Mickey Mouse to star in a cartoon version of Paul Dukas' The Sorcerer's Apprentice. Advanced 'specification creep' then set in. The end result was a full-length animated feature with the Philadelphia Orchestra captured in 'Fantasound' by a thirty-three microphone, nine channel, sound system that was years ahead of its time. 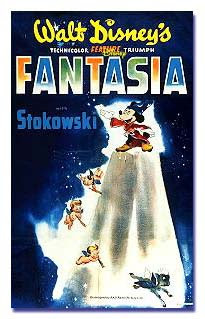 Fantasia was released in 1940, and went on to become a classic. Walt Disney produced a masterpeice of the cinema, while Stokowski introduced generations to the riches of classical music with his interpretaions of eight classical works. These famously included his own orchestration of Bach's Toccata and Fugue in D Minor, and Stravinsky's Rite of Spring which plays against the famous dinasour sequence. (See footnote). Stravinsky's choreographic masterpiece spans sixty-five years to another project aimed at getting those elusive new audiences dancing into our concert halls. First take a disused bus depot in a blighted Berlin industrial area. Then fill it with 250 Berlin teenagers dancing to Stravinsky’s Rite played by the Berliner Philharmoniker under Sir Simon Rattle. Next ask directors Thomas Grube and Enrique Sánchez Lansch to make a pacy film following three of the participants through the three-month rehearsals. Then mix a score which includes the Rite. Add specially commissioned music from composer Karim Sebastian Elias, and combine with a contribution from Berlin underground rock band The Wickeds. The result is Rhythm Is It! Could this be the next Fantasia? 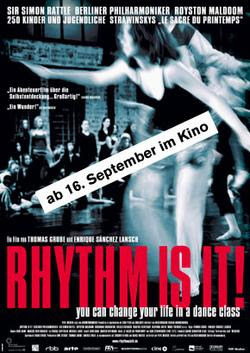 Filmed in 2003 and released in 2004 the film hasn't yet made too many waves outside the German speaking countries despite some great reviews. Fantasia was a stroke of genius because it overlayed two media, cartoon animation and classical music, without diluting either. Rhythm Is It! is great viewing. But for me the mix of three musical genres results in a film that won't offend those who don't appreciate classical music, but also won't inspire and extend them in the way Fantasia did so brilliantly. Make up your own mind by visiting the Rhythm Is It! web site, and watching the trailer. Or buy the DVD online. Or just sample the score with these audio files, and enjoy the first rock music ever on an overgrown path! Then tell us, using the comments feature below, whether you think Rhythm Is It! will bring in those "neophytes, the dabblers and the ungray". Footnote - In 1961 Stravinsky wrote that he received $1,200 (his share of a total $5,000) for the use of his music in the film. He said the music was not covered by copyright in the USA at the time, and he was told it would be used regardless of whether he granted permission. But Disney wanted a formal copyright agreement so the film could be shown in other countries. In typical Stravinsky fashion the composer managed to have his cake and eat it. He took the money, and then went on to describe the use of his music as "execrable", and said the segment as a whole "involved a dangerous misunderstanding." He would have been very much at home in today's music-like-water marketplace. Great response to this story on the excellent From the New World titled Fantasia Fantasies. Quote..."Rattle is the English Thielemann. Both are adept at talking a good fight, but when push comes to shove, they fold like poorly-constructed houses of cards.That having been said, it's swell the kiddies are getting into classical. However, let's use Mahler. Stravinsky is a bit much." Rhythm Is It! plays at the Museum of Fine Arts on Sept 11 at 3:30 pm for those of you in the Boston area who might want to see it.